Teddy was doing great in the ring, and then he saw ... TOYS! Crate, pads and blanket in car… check! Armband holder, water, bowl, treats (gotta have treats)… check! Rally sign book, training leash, collar… check! Breath mints, snacks, water… check! Mellow Out, a calming spray for the dog… check! Little rolling box for all of the above… check! 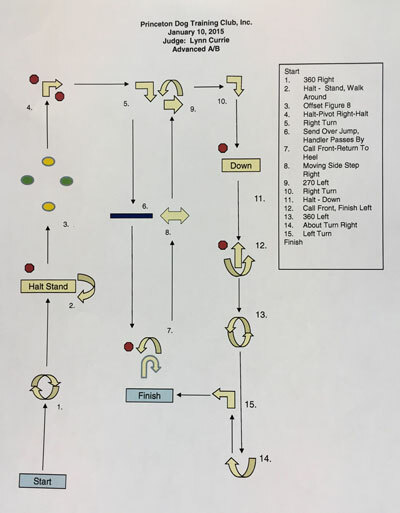 One more pivot practice, one more figure 8 with distractions at 10 p.m. … check! All this to prep for less than two minutes in the ring tomorrow at a Rally trial in Princeton, N.J. The second leg of Teddy’s Rally Advanced B title is our goal. Ring 6, 11:30 a.m. … CHECK! Nudged awake by Merlin … time to get up and feed dogs. Hubby John gets up, too, to make coffee for me. What a doll. The hardest decision I have to make this morning is what to wear, so I fall back on my “uniform”… black pants, turtleneck and vest. Can’t go wrong. Teddy in his crate in the car, last minute picture of him to post on Facebook. Wawa our first stop…for my fix…coffee and a donut. Second Wawa stop, this time in Burlington, N.J., my favorite place to buy cheap gas. I could use a 10-minute cat nap but that’s not going to happen. Teddy’s water bucket has overturned in his crate. Holding up a dripping wet paw, he gives me that helpless face. The crate pad is soaked. Back into Wawa to buy paper towels. I cover the crate pad with the blanket. I hope this isn’t a sign of the way our day will go. We’re back on the road in 10 minutes, me with a box of “Good & Plenty.” Seems like the right kind of candy to have on this day. We arrive on the campus of Rutgers University. 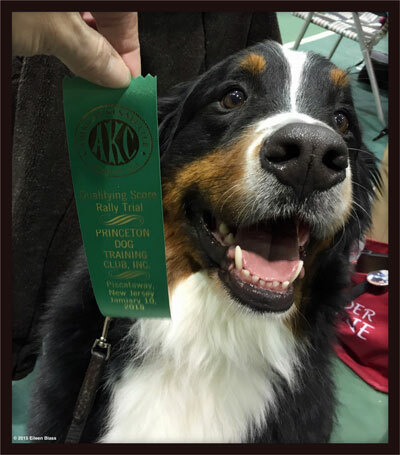 The show, put on by The Princeton Dog Training Club, is at the Sonny Werblin Recreational Center. The parking lot is packed. I park in the far corner of the lot and make the first of my three trips into the facility with stuff. Soft crate first. A brief panic upon seeing the facility crowded with crates. I don’t see a spot for Teddy’s crate. Guess I should have left earlier. But I get lucky and find two very nice people standing in an open spot. They let me move in. Whew! Crate set up, blanket down, a quick spritz of calming spray on the blanket. We’re in business. Back to the car to get my chair and bag of stuff, then another trip back to get Teddy. 9:52 a.m. – Hundreds of dogs … and Speedos? Teddy is remarkably relaxed. We visit a large potty area outside and then go inside the facility to settle in. I’m amused that on one side of the building there are boatloads of dogs, the other side scores of kids in Speedos. There’s a swim meet going on. A little walk down the hall and we meet families of young swimmers who can’t resist Teddy. Here comes that familiar question…. “can we pet your dog?” Of course! He’s the friendliest dog on the planet! With Teddy in his crate, I wander around the facility looking at the large competition rings. There’s Obedience and Rally taking place in the same facility. I check out ring 6 where we will compete. Rally Excellent is getting ready to start. 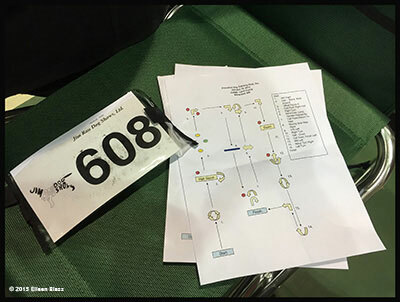 I pick up my armband at the check-in desk, we are team #608. I grab a map of our Rally Advanced course and a map of the Excellent course too. Many of the signs for Advanced and Excellent are the same with a few more difficult signs in Excellent. I want to see what the competitors in Excellent are doing. Back at our space, Teddy is happily munching on a bone in his crate. I pull out my little Rally sign book and start to study the course. The little Rally book has been a fabulous tool for me. I saw someone using one at a trial last year in Delaware and ordered one for myself. It’s much easier than pulling out my phone and trying to Google a sign because I can’t remember the proper way to perform the exercise. I spent the next hour or so hanging out at ringside watching the Excellent class, running to the bathroom (all that Wawa coffee is taking its toll!). At one point, a visit to the restroom involved taking Teddy. I was in the stall while he waited patiently for me, his nose peeking just under the door. I’m sure that would have made an interesting photograph. Teddy is bored and it’s time for a potty break and a little warm up, so outside we go. I have the motivator in my hand…cheese! I can use a treat to warm him up but no treats are allowed in the ring, so we go up and down the sidewalk working on attention, sits and downs, heeling around turns. He is happy. I am happy. It’s time for the walk-through of our Advanced course. 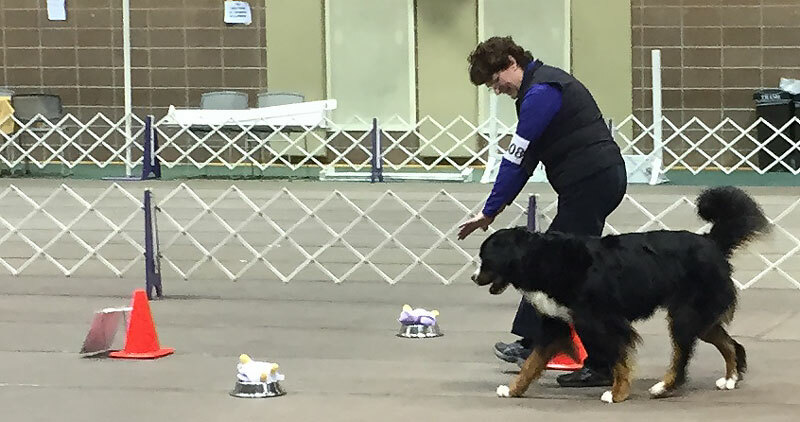 Sixteen handlers enter the ring, without their dogs, and walk the course giving signals to their imaginary dogs. It’s really a very funny scene. Some day I’m going to do a video of this. At any rate, I am thrilled because this course has straight lines and four directions with the exception of the last two signs. I’ve been on some courses that go right, left, around, diagonal, this way, that way and all I end up is dizzy. This one is great. I can spend my energy and focus on Teddy and not worry about losing my way. Time is up, and we are set to begin. We are fifth in the ring. We are focused. We enter, both of us are smiling. Teddy is relaxed. I am relaxed. We go to the start, off comes the leash, are you ready says the judge? Ready, says I! Our first sign is a 360 degree circle to the right. Good, Teddy is watching me, he’s right with me. Into station two, It’s a sit at heel position, stand, stay, and then I walk around Teddy and pause. Awesome. Next we go to the figure 8 with distractions. We love figure 8’s but distractions are hard. There are food bowls on either side of the center spot. There are toys in the bowls. TOYS! In we go to the figure 8. MAYDAY MAYDAY MAYDAY. Teddy’s nose goes to the bowl. Oh my God, it’s over. Think quick, Blass. I sounded like an auctioneer. We exit the station to do it over, make eye contact with each other and I say to Teddy “with me.” We make our way three times through that figure 8 successfully, and I’m starting to breathe again. This is where the straight lines are really helping me. I know where I am. I can relax a bit through the pivots and turns, and over the jump. The rest of the course we can handle. Then a brief scary moment when Teddy lost focus and started looking around at people standing outside the ring. During a call front, he started to scratch his collar, a sign of stress that I now recognize. He was probably feeling my nerves. Just get through this big guy, it’s almost over. He is still looking around as we pass the ring opening. Please don’t leave the ring, Teddy! I screw up and take a wide turn on the 360 degree left turn. You would have thought I was walking around the state of Texas, but we recover and have only two more stations. About turn, turn left and we are finished. How long did that take? A minute and 50 seconds? It felt like two seconds. But we were done. Whew! I hope I didn’t miss anything on the course. Wonder how many points we lost for the figure 8 mess. I hope we qualified. I get Teddy back in his crate, run over to congratulate a friend who just earned her first Companion Dog leg and then sheepishly walk over to the posted scores on the wall. We got a 92 out of 100 points. That is a very respectable score. I’m amazed and elated. We are ready to go home, but not before posting a brag about the experience to Facebook. It’s been a great day. Much of the drive home, I ran that course over and over and although we made some mistakes, it was very clear to me that the improvements far outweighed any slip ups. Teddy’s attention was much better, he was more relaxed. So was I. The more shows we go to, the more experience we get. We have a routine and a plan and all of that builds confidence that translates into success. The bottom line is that it doesn’t matter if we don’t go home with that little green qualifying ribbon. If we qualify, that’s great. If we don’t, I still arrive home with the best Bernese Mountain Dog in the world. He’s my best friend. What could be nicer than that. I hope you continue writing your experiences with Teddy they are wonderful! A great day for you and Teddy. I enjoyed reading your experience with this rally. Good boy Teddy. Eileen I love the way you can tell a story. Thanks. So glad Teddy did well & I love the description of the toy distraction :). Weimaraner’s name is Boomer. God bless his heart, he’s our old fella, but still in the middle of it all at almost 14 years old. Great comments , Eileen!! Way to go Teddy!! Thanks Bonnie, we’re having entirely too much fun. Thanks so much, Terry. Sorry to hear about your Madeline. She was a great age and she was loved for a long time. 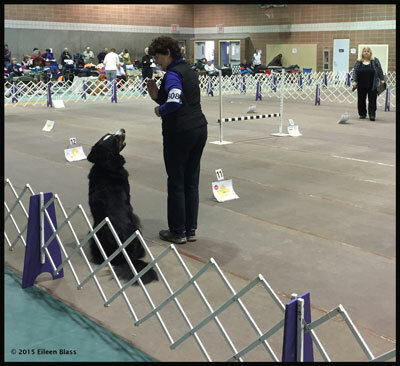 Hopefully you can come to the Potomac Valley BMD club show February 13-15th in Frederick, MD. Here’s the link to the event. I loved reading this, and of course, I love Teddy! What fun. Almost like being there 🙂 Great work with Teddy. WTG Teddy & Eileen!!! Loved reading this!!! Thank you Diane. Hope to see you in a few weeks at PVBMD 🙂 We are in Rally on Friday….the 13th. Could that be any more perfect? I loved reading this adventure! It brought me back to my nerves and stressful feeling when I had my first Alaskan Malamute in the obedience ring going for his CD. Oh my goodness he was so stubborn. I don’t think “we” were ever relaxed. Lol! It was so many years ago and this brought it all back! How fun and rewarding to have your best friend by your side! Thank you for sharing this! Way to go Teddy!! I loved reading this. Felt like I was there with you throughout the day! And the toys! Keep the coming. Thank you for your nice comments. Very much appreciated. EILEEN JUST LOVED READING ABOUT YOUR ADVENTURES WITH TEDDY HE IS A GORGEOUS BOY AND LIKE A PREVIOUS SUBSCRIBER I WOULD JUST LOVE TO GIVE HIM A BIG CUDDLE. BEST OF LUCK TEDDY IN THE FUTURE TRIALS. Thank you, Mary. Teddy would give you a big cuddle back.